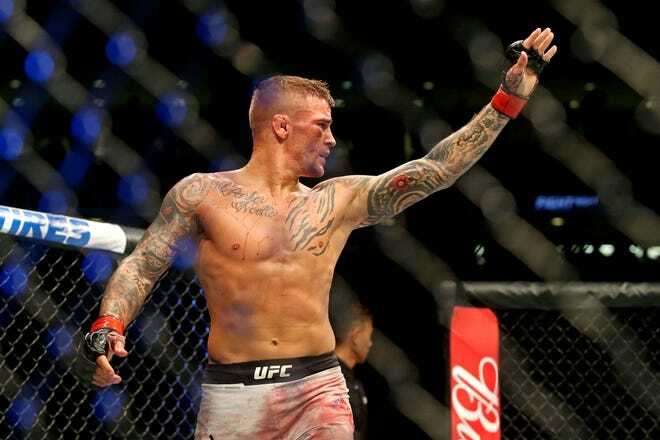 The flashy off-the-cage kick, which has garnered million of views over the years, gave Pettis all kinds of momentum as he arrived in the UFC, where he eventually won five straight fights and claimed the belt with another win over then-UFC champ Henderson. MMAjunkie recently caught up with Pettis to discuss the legendary kick – and why it wasn't always a good thing in the years that followed. “The crazy thing is that I tried to be that guy too much, where I was forgetting what got me to that ‘Showtime kick,'” he said. “Like, watch that fight. It wasn't like I was throwing those kicks the whole fight. It was one ‘Showtime kick,' and it landed. It was great basics, clean technique. “I got away from that technique side because I was focused on wrestling so much. There was just a lot of crap that I just had to fix, so I found out what I needed to do, and I'm back doing it.” Next up for Pettis, who's in overall 2-5 skid (but against a who's who of featherweights and lightweights) is a bout with Michael Chiesa (14-3 MMA, 7-3 UFC), who's No. 9 in the USA TODAY Sports/MMAjunkie MMA lightweight rankings. The bout, which is part of the stacked UFC 226 pay-per-view event on July 7 at T-Mobile Arena in Las Vegas, is a big opportunity for No. 12-ranked Pettis (20-7 MMA, 7-6 UFC) as he tries to reclaim contender status.